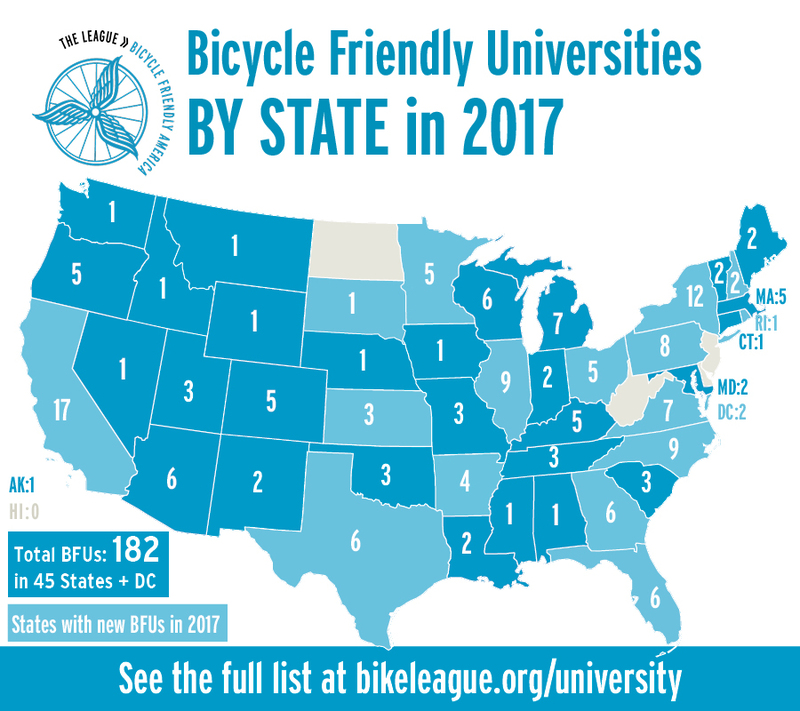 Today, the League of American Bicyclists announced 46 new and renewing Bicycle Friendly Universities℠ (BFUs), There are now 182 BFUs in 45 states and Washington, DC, a cutting-edge group of colleges and universities across the United States transforming their campuses and the communities around them. Two states welcomed their first Bicycle Friendly Universities this round. South Dakota’s Black Hills State University in Spearfish and Rhode Island’s Brown University in Providence both achieved Bronze BFU status. The latest class of Bicycle Friendly Universities will maintain their 2017 awards through 2021, at which time they’ll be required to reapply to the BFU program to either maintain or improve their award status. In addition to the 46 new and renewing awards given this year, four campuses are being recognized as Honorable Mentions in 2017. Campuses that receive no award or Honorable Mention are provided with feedback to improve and encouragement to re-apply to the BFU program after implementing the League’s feedback to earn the Bicycle Friendly University title. To apply or learn more about the BFU program, visit the League www.bikeleague.org/university. The Bicycle Friendly Community℠, Bicycle Friendly State℠, Bicycle Friendly Business℠ and Bicycle Friendly University℠ programs are generously supported by League members. To learn more about building a Bicycle Friendly America, visit www.bikeleague.org/BFA. The League of American Bicyclists is leading the movement to create a bicycle-friendly America for everyone. As leaders, our commitment is to listen and learn, define standards and share best practices to engage diverse communities and build a powerful, unified voice for change.